James Kerley is an award-winning freelance technology writer, consultant, the former Editorial Manager for Yahoo!, and Senior Editor at MapQuest. When you purchase a smartphone, the device is typically locked to the carrier's network. That means the phone can only work with the carrier you bought the phone from even if it's compatible with another network. Unfortunately, while unlocking a Samsung Galaxy device from a carrier isn't necessarily hard, there is no way to do it entirely yourself. You will need help, either from your service provider or a third-party. Here's how to unlock any Samsung Galaxy device, from a phone to a Tab to a phablet. No matter which route you choose to carrier unlock your Samsung Galaxy, you'll need your IMEI number to get started. Open your phone app to the keypad. Your phone will immediately go to a screen with the IMEI and MEID numbers. Write down the top one, the IMEI number. Write the whole thing down, but note that you typically just need the first 15 digits (everything before the slash). Tap OK to return to the phone keypad screen. From any Home screen tap Apps > Settings. Scroll to and tap About device > Status. Scroll to view the IMEI number and write it down. While this is virtually exactly the same across any Samsung Galaxy tablet, screens may vary. If you don't see an IMEI number in the Status screen, look for the Serial Number, sometimes listed as S/N. Write it down and use that number in place of the IMEI. If your phone or tablet qualifies, this is the best, cheapest and most painless option. If you want to unlock your Samsung Galaxy for free, this is your only option. Ensure your phone is eligible: You typically have to own the device, and sometimes carriers require it's been paid off for a certain amount of time. Generally, your carrier's website should have clear information about what will qualify, but if not, call them or initiate a chat with a representative. Contact your carrier with your IMEI handy. You may also be required to provide account passwords and other identity verification. Once a customer representative has confirmed your device is eligible to be unlocked, they may request your IMEI number. If your device is eligible, your carrier might be able to unlock your device to use with other SIM cards without you having to do anything. Or they may trigger an over-the-air-update, and in some cases provide an unlock code that you would need to enter upon inserting a different carrier's SIM card. If you don't own your phone yet or otherwise aren't eligible for a carrier unlock, this is one of only two other choices for unlocking your Samsung Galaxy device to use on another carrier. You will find many options, but ensure the service you select has good reviews and is legit. One of the top rated and most reliable is UnlockRiver. Pick your service. We recommend UnlockRiver, but you can ask around for a recommendation. Enter your device's information. This will include things like manufacturer and model. This is where you'll use that IMEI number you wrote down. In a day or two, you'll receive your unlock code in your email inbox. Write it down or put it somewhere safe. Insert a SIM card from a different carrier, and you will be prompted to enter the unlock code. Once your Galaxy phone, Tab or Note is unlocked, you should be able to use SIM cards from any carrier in any country. 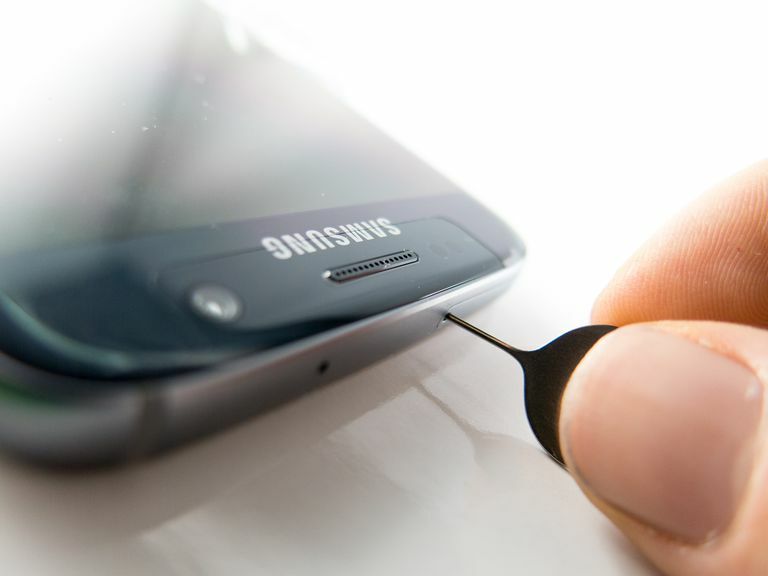 There is a third option, and that's to have a repair shop carrier unlock your Samsung Galaxy device. You'll need to leave your device with a shop for a day or two, and it will run you about the same cost as using a third-party website to get an unlock code. Most repair shops will just use an unlock website to generate a code to unlock your device, so it's not a recommended option if you're comfortable doing it yourself. But, if you prefer the convenience of someone else taking care of everything, this might be the option for you.